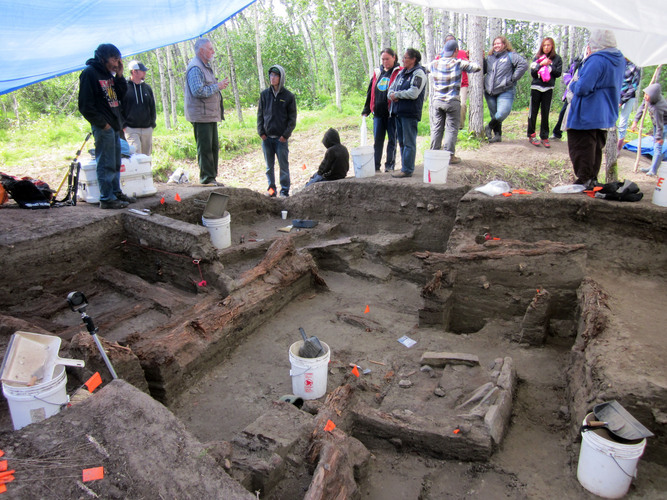 Brown University archaeologists have uncovered the site of a village in northwest Alaska that's believed to be at least 200 years old. The village dig is in Kobuk Valley National Park about 20 miles up the Kobuk River from the community of Kiana, according to KSKA. Arctic archaeologist Doug Anderson estimates about 200 people lived in the village, which he believes was a regional capital. Researchers think the village dates from the late 1700s to the early 1800s, just before initial contact with explorers. Anderson said he's never seen a site quite like the one uncovered where so many houses were connected by a web of tunnels. He has been in archaeologist for more than 50 years, specializing in prehistory and early history of northwest Alaska. "In some other areas here we've found maybe two houses that are connected by tunnels, but nothing like this," Anderson said. "And in other areas those houses are really quite small compared the houses here; these are gigantic houses." The dwellings are the size of a one-room cabin and are dug about 4 feet into the ground. The structures are framed by spruce beams and poles with sod and earth walls and a fireplace at the center. Researchers found signs that villagers lived closely with dogs. They also found two sets of human remains in one dwelling. One of the sets was of a young child, while the other was a man with a broken leg. The remains eventually will be returned for burial. Kiana is 510 miles northwest of Anchorage and 57 miles east of Kotzebue. The archaeology team is working with the Kiana Traditional Council and the National Park Service to ensure the project moves forward. Inupiat Eskimo Thomas Jackson said his mother told them when he was a child that his ancestors had lived in an old village in the area. "You, you're a descendent from these people," Jackson said. "That's the first time I've heard this as a child." Kiana resident Debba Barr toured the site. "It makes me feel proud," she said. "And it's a little bit overwhelming when you see all the hard work and all the stuff that we did compared to how we live now." Barr would like to know how the houses were built — and so would researchers. They found no tools at the dig, so how the subterranean dwellings were constructed remains unknown.